In Forex or Foreign Exchange trading, there are several terms that you need to be aware of in order to make investing easier and more efficient. Unlike trading stocks in the share market, you do not buy a share and wait for the price changes. Forex operate on a totally different platform and style. The most fundamental form of trading forex is to first understand that the rates of the foreign exchange are usually quoted in pairs. This allows you to make a comparison between a certain benchmark of a currency to evaluate the changes in the price of another. Majors – What are they? The actively traded currencies in Forex are known as Majors. In most situations, the Major Pairs are put together with the US Dollar as it is the most popular currency in the world and perhaps most influential. This is the basic rule for anyone planning to trade in forex regardless if you are a new player or a seasoned one. The Majors are used to refer to the most frequently traded currencies which apart from the USD include the Euro Dollar quoted in EUR, Japanese Yen quoted in JPY, Australian Dollar or AUD, Swiss Franc or CHF and the British Pound or GBP. It is imperative and highly important that the symbols associated to each currency is understood as they are used in all trading activities and will most likely to be featured when you are carrying out your research or any background check on the specific currency. Another term which is frequently used is a Commodity Pair. This refers to the 3 main forex pairs which involve countries known for its large amount of commodities which are the United States, Canada, Australia and New Zealand. In Forex trading, the 2 pairs (Major and Commodity) are most commonly traded as they are regarded to be the most liquid in the world currency. Collectively, these pairs constitute a majority of all the trading that takes place in the market where buyers and sellers usually trade them in very large volumes. Apart from that, these pairs have the tightest spreads which means that they provide investors with a lot of potential of earning a profit in a relatively short time. 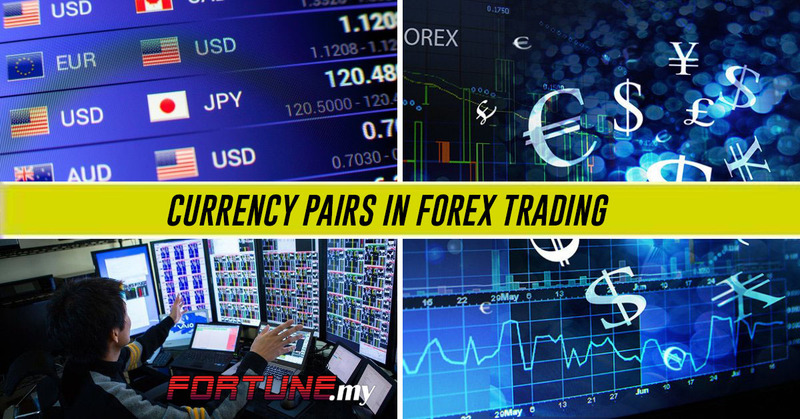 There are in general 4 major pairs that are commonly traded in forex namely EUR/USD, USD/JPY, GBP/USD, USD/CHF. On the other hand, the AUD/USD, NZD/USD and USD/CAD are the most popular Commodity Pairs traded. Forex pairs are traded in fixed contract sizes which are known as lot size as well. The standard size traded in forex is 100,000 units of the base currency of a specific pair although there are some which offer 1,000 per lot trading. A spot price is the official quote rate of a certain currency at the specific moment of time although traders will usually provide an offer price known in some markets as the ask price. Traders will then wait for their bid price before ordering. The spread here refers to the price differential which is defined as pips. For instance, if the quotation (ask price) for a GBP/USD is 1.4857/1.4859, then the pip is USD0.0002 which means it is 2 pips here. In most cases, brokerages do not charge any transaction fee where they earn their commission based on the pips which means that they will offer a price with a lower pip so that the amount is compensated. If you believe that the GBP will increase relative to the USD, then you can buy at the price you desire and sell it off when the pip is good enough to earn the profit and vice-versa if you have grounds to believe that the GBP might drop relative to the USD. You must be wondering why the few currencies are paired and used as examples as above. They belong to the few most tradeable currencies in the world today. There is no doubt that the US Dollar is the most traded currency in the world. It is a benchmark used in most pairs with all other types of major currencies. The US Dollar is the intermediary in transactions involving triangular currencies and is the unofficial global reserve currency which is kept by almost every central bank in the world. After all, the US Dollar is accepted in almost every country and economy while it is even used as an official currency in certain countries too. This is known as dollarization while it is being used as an informal alternative payment form although those countries have their own local currency. The Euro is no longer a new currency since it was introduced back in 1999. Today, it is the second most traded currency in the world and is the second-largest reserve currency after the US Dollar. It has since become the official currency for most nations in the Eurozone where many countries in the continent has already pegged their local currencies to the Euro. In fact, some African countries have followed suit to stabilize the exchange rate in a practice similar to the US Dollar. As an Asian currency, the Japanese Yen is the most traded currency outside the continent. It has often been perceived as the proxy to the economy of Japan which is highly manufacturing-export centric. Speculators and investors will use the Yen to gauge how the economies in the Pan-Pacific region is preforming. This means that a change in the value of the Japanese Yen would have some implication on the economies like Thailand, Singapore and South Korea. The Pound Sterling is currently the fourth highest in terms of traded currencies in the world. Compared to other global currencies, it has a large reserve and is the local currency for the UK despite accepting the Euro since it was introduced. The UK, which has exited the European Union in 2019 has seen the Pound Sterling strengthen since then.